Although we have created a lot of materials explaining GRAFT (both existing features and future developments), including countless technical or semi-technical pages, marketing brochures, blog posts, and educational videos, it’s often difficult to see the whole picture while going through all of the specifics. A focus on the multiple features and their design details can obscure the view of the entire system, creating a so-called “you can’t see the forest through the trees” effect. We are getting many questions from supporting community members as well as potential customers and partners about “the big plan”: what is the ultimate goal, and how exactly are we going to achieve it? Whereas the answer to the first part of this question is quite simple and short, the answer to the second part requires some time and efforts. In this series of blog posts we will iterate through the various GRAFT features and try to explain why they are there, and how they help achieve our ultimate goal: Conquest of the crypto payments world. Let’s start from the very beginning with the blockchain, or layer one of GRAFT. The blockchain is maintained by a peer-to-peer network of computers, or network nodes. We refer to these network nodes as “cryptonodes” to distinguish them from our “supernodes” (a.k.a. “masternodes” in other networks), which constitute the second layer of the GRAFT network (to be explained in a future blog post). The GRAFT blockchain is based on the CryptoNote protocol, which is the most private blockchain protocol in use as of today. In order to save time and resources, we used the luxury of the open source principle and forked the initial code of the GRAFT cryptonode from Monero — the best implementation of the CryptoNote protocol. In addition to acquiring fundamental privacy features “out of the box”, forking Monero provided a high degree of confidence in our blockchain from day one of the mainnet existence. It’s important to note that the code of GRAFT supernodes, which we create from scratch, is also open source, so essentially everything that we add on top of the previously existing features is also available for others to reuse. Now let’s go back to the initial question and apply it to the blockchain layer: Why a brand new blockchain and why CryptoNote? We’ll start with the new, dedicated blockchain: Yes, it would have been easy-peasy to run the GRAFT ICO on ERC20 or a similar token, as most people do these days to avoid blockchain maintenance, mainnet, mining, emission, seed nodes, etc. However, creation of the GRAFT payment network requires our own blockchain because we have to modify the cryptonodes as we develop the supernodes so they will support each other and work together. Without the ability to modify the code, we wouldn’t be able to create the network of supernodes and implement features like real time authorization or exchange brokers on top of any existing blockchain or token platform. In addition, there are features such as payout tokens, loyalty points, store credits, gift certificates, and discount coupons that are required for merchants — all of these are based on the merchant tokens platform, which cannot be built without a dedicated blockchain. Now for CryptoNote: it’s not just “nice to have”, it is absolutely required in order to be competitive with traditional payment systems such as Visa network or PayPal. Ironically, Visa and PayPal provide much better privacy to their customers than most existing cryptocurrencies such as Bitcoin and Ethereum. Let me explain. When you swipe/insert your payment card at the point of sale terminal, or click the PayPal’s pay button online, there are two entities in the world that are aware of your transaction: the payment network (Visa or PayPal in our case) and the merchant. In reality, of course, there are more organisations that “know” about your transaction because the payment network is more complex. This network includes, at the very least, the issuing bank (the one that gave you the payment card), the acquiring bank (the one that approves the payment), the payment gateway (the one that routes your transaction to the right payment processor/acquiring bank) and the payment processor (which processes the payment and merchant’s payout). However, in any case, this list of organizations is limited because they are under security and privacy regulations, and they have typically implemented some decent security controls that protect your transaction records from prying eyes. Of course, everyone in this list can be hacked or give away your info to a law enforcement agency, but this is a different story (which is, by the way, another good reason to switch to cryptocurrency payments and throw away your plastic cards!). For the sake of simplicity though, let’s assume that random people cannot gain access to your data in most situations. Finally, let’s see what happens with blockchains. The key innovation of Bitcoin (the first blockchain and cryptocurrency) was the open ledger that is accessible to every node participating in the network because your transaction must be verified to make sure you are not trying to spend your money twice. But this also means that anyone in the world can see your transactions and how much money you have in your wallet! Now, unlike plastic cards, Bitcoin wallets are, in principle, anonymous because transaction records are not directly linked to your identity. At first glance, this feature appears to compensate for the fact that your transaction records are laying there in plain sight on the blockchain for anyone to see. Well, the problem is that there are ways to link addresses to identities. Once this happens, all of your transactions magically become visible forever because the blockchain is always there and it cannot be erased! Fortunately, there is a solution: the CryptoNote protocol, which hides the sender’s address, the recipient’s address, and the transaction amount , while still preserving the ability to validate each transaction and prevent double spending — and it’s all thanks to advanced cryptography! One day I am going to explain how it works in layman’s terms to unveil the beauty of CryptoNote and its cryptography (the same as I have done to explain RSA and Elliptic Curves cryptography in my book about Bitcoin payments). But for now, let’s just take it on faith that CryptoNote ensures a high degree of privacy for all participants. 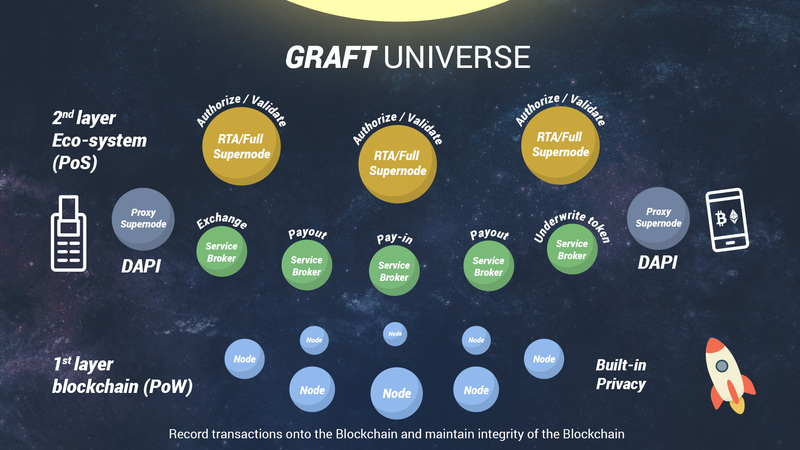 Moreover, on top of existing CryptoNote features, GRAFT adds even more privacy and hides transaction fees! Why a brand new blockchain and why CryptoNote? The dedicated blockchain allows GRAFT to create a merchant token platform. This is required for features like payout tokens and loyalty programs, and the second layer supernode network, which enables special retail features such as real time authorizations and exchange brokers. The Cryptonote blockchain protocol provides an absolute privacy to all participants of the transaction, which is required in order to compete with existing payment platforms such as Visa or PayPal that are more private than most exciting (non-Cryptonote) cryptocurrencies.